When this home was renovated in 2008, no expense was spared to upgrade and decorate this house with every amenity. 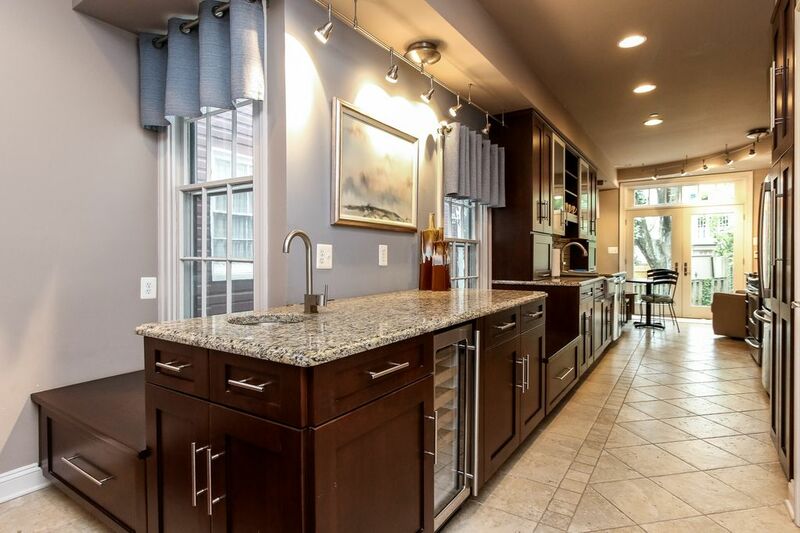 Cherry hardwood cabinets with stainless appliances and accents, granite counter tops, gas stove and glass block tile backsplashes makes this kitchen a gourmet chef's delight. And cozy too with heated tile floors! Open living area features hardwood floors, all new furniture and additional sleeping on a pull-out queen sleep sofa. Half bath and full washer/dryer on the main level. Upstairs are two bedrooms with full baths, one with a king bed and one with a queen. A private yard with patio and grill are the finishing touches on this well-appointed home, designed with your comfort in mind. Parking is easy on this quiet one-way street. Arrangements can be made in advance for your parking passes ($5/day per car), and I will have them ready for you on the kitchen counter for your arrival. I love doing house renovations, and have done several in the Historic Annapolis area! Rather than sell them, I like to renovate then rent them for short term rentals. You get to enjoy the benefits of a gorgeous new home in the heart of one of the most beautiful historic districts you will find! I bought the property because it was a disaster! On the existing footprint, I was able to build a full new house on the interior while maintaining the historic character of the exterior. You just can't beat the location of this house. It is so close to all that Annapolis has to offer, but on a quite one-way side street with easy parking! Located in the heart of the Historic District of Annapolis, but on a quiet side street with easy parking. Central air conditioning, and supplemental window units in the bedrooms for added comfort. Drip coffee maker with gold cone filter. No paper filter necessary. The spacious master bedroom has a king bed, two closets and a master bath with full tile shower. The second bedroom has a queen bed and full bath with tub/shower. Sleeping accommodations can be expanded to sleep six using the main room queen sleep sofa. Catering Available. This home is located in the Historic District of Annapolis, one block off Duke of Gloucester on a charming, quiet one way street. So you are in the heart of downtown without the noise and activity. Two blocks to Church Circle or Main Street; five blocks to the Visitor Entrance of the Naval Academy.